Supports 3D signals, including Frame Packing, Side-by-Side, Top-to-Bottom, and others. The Spitfire Pro HDMI (HDMI/USB/IR) over Cat 5e/6 KVM Extender Kit from Avinair is comprised of a local transmitter unit and a remote receiver unit. The transmitter sends digital 1080p 3D video, audio, and control signals to the receiver via a single Cat 5e/6 cable. 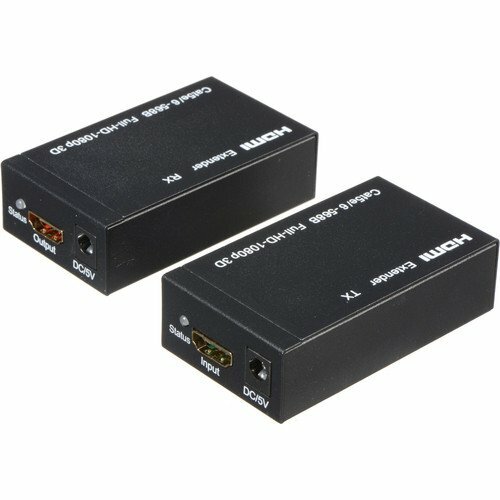 The receiver separates and rebuilds the signals, and outputs them through an HDMI interface to a multimedia display, which can be up to 170′ away from the video source. The Spitfire Pro also supports bi-directional remote IR, power over UTP, and EDID call back. Both the input and the output are HDCP 1.2 compatible. Box Dimensions (LxWxH): 8.9 x 7.1 x 2.0"